The following are details of the various modules offered in the RightChanges Coaching Solution Package Series. Did you know that updating your resume is NOT the first step when searching for a job? In fact, there are three steps prior to updating the resume that, if skipped, could be sabotaging your job search efforts. Upon completing the Essentials series, you will understand how the job market changed and the steps you need to follow to land the job you want. You will receive powerful templates and current job search strategies. When looking for a job, every day finances are a major concern. Financial Tips for the Job Search provides ideas on conserving current funds, links to other financial resources, information on what job search expenses are tax deductible, and places to go and things to do in town that are inexpensive or even free. Attitude is the first and most important step of a job search. Losing a job can be devastating and, if not addressed, can show in your body language, word choice, or in the energy you need for the job search. During the module Processing the Loss & Choosing a Positive Attitude we identify where you are in handling the job loss, techniques to maintain a positive attitude, and your readiness to accept the opportunities that are ahead of you. You have a new job: selling your skills, abilities, and experience. Before successfully selling anything, you have to know the product, how it works, and what makes it better than the competition's. The same goes for the job search. In the Skills and Aptitude Assessment sessions, you will understand your product, YOU, through a series of inventories and assessments, and learn to articulate your competitive advantage so you can clearly state why an employer should hire you over the competition. This job market is competitive for people with years of experience. How does a recent graduate compete? In this optional module The Job Market for Recent Graduates, RightChanges will help you with identifying the advantages you bring to employers over candidate with years of experience and we help you format your marketing materials and interview answers to highlight these advantages. Whether you are returning to the job market following an extended family leave or because you decided to come out of retirement, you are now competing with people who have been in the job force while you were not. In the option module Re-entering the Job Market, RightChanges helps you identify the value you bring to employers and the transferable skills you developed while you were away. Just as in sales, you need to know what companies are buying the product and what markets are preferred. In the job search you need to know where you want to work and who is hiring. 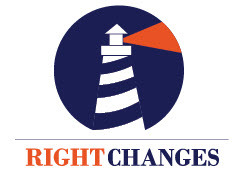 In the Target Market Analysis session, RightChanges will assist you in identifying your target companies and other requirements important to you such as salary, management style, company culture, and geographic location. Did you know that the resume is only one piece of your marketing materials and is the least used? In this job market you need, at a minimum, an elevator pitch, a business card, a marketing plan, and a Linked In Profile. You also need to know how to handle other social networking sites. In Developing All Essential Job Search Marketing Materials, your RightChanges coach will work with you in developing a personalized suite of powerful marketing materials that represent you. Some people know what they want to do "when they grow up"; many, regardless of age, do not or believe it is time for a change. In this optional module, your RightChanges coach will help you in Determining Your Ideal Job based upon your skills, interests, values, and passions. The answer is inside of you, we will work together to find it. Most hiring managers only spend 8 - 12 seconds reviewing each resume. The resume is an important piece of your marketing materials. In the Essentials Series’ Resume Review, your existing resume is reviewed to be sure it is formatted to have the biggest impact. Accomplishments and transferable skills are highlighted so hiring managers see them in the first few seconds. Although it is easier to e-mail out resumes or apply to jobs online, only a small percentge of job seekers get their job using that method. It is through networking that the majority of seekers find a job and it is through networking that you will find the hidden job market. In the Identify Networking Opportunities module, your RightChanges coach helps you identify numerous network opportunities: industry related, position related, and within the community. A calendar and action list are developed, giving you specific goals to achieve. Networking is the #1 way to find your next job. For many of us though, we would rather have a root canal. Whether you are an introvert or extrovert, good networking skills are learned and developed with practice. In the optional module How to Network, your RightChanges coach will give you tools and suggestions to make networking less intimidating and more productive. Your RightChanges coach can even do role playing with you to give you practice approaching others. No one ever rejected a surgeon because she was overqualified. When employers say a candidate is overqualified they are actually saying something else. In the optional module Overcoming the "Overqualified" Objection, your RightChanges coach will explain what the employer really means and ways to proactively respond to their unspoken concerns. You will also learn other techniques in de-aging all aspects of your job search. Most people would not think about engaging in a friendly sporting event without warming up first but too many job seekers try to wing an interview when a real job is on the line without practicing. A picture is worth a thousand words. Nothing lets you know how you perform in an interview like seeing it yourself. In the Customized, Filmed Mock Interview, RightChanges performs the practice interview with the position and company you choose. The Coach researches the position and company and develops interview questions the real hiring manager would ask. Following the mock interview, your RightChanges coach will play back the digitally recorded interview and point out what you did right and areas to improve. In addition to the feedback, you will receive the digitally recorded interview and the raw research materials gathered by the coach about the company and position you selected. * Client must complete all necessary work on time to qualify for the unlimited follow-up sessions. You will receive access to a “members only”, nationally renowned, internet job search web site. The Comprehensive On-line Tools include career tests and tools, other job search tips and research, Christian resources, an extensive Explorer's Guide, and much more. A truth of the new job market is that your next job is not your last. The day of the "gold watch retirement" is gone. Beginning day one of your new job, there are specific action items once employed that you want to take to stay on top of the job market so your next transition is easier and shorter. Time: One 1 hour session.